I’m always on the look out for a dessert that will make my boys feel like I’m indulging them but is healthy enough to dish out midweek on a regular basis. And, I’m sure you know by now that I’m also always looking for ways to make a recipe quicker and more delicious so that you’ll want to make it too. 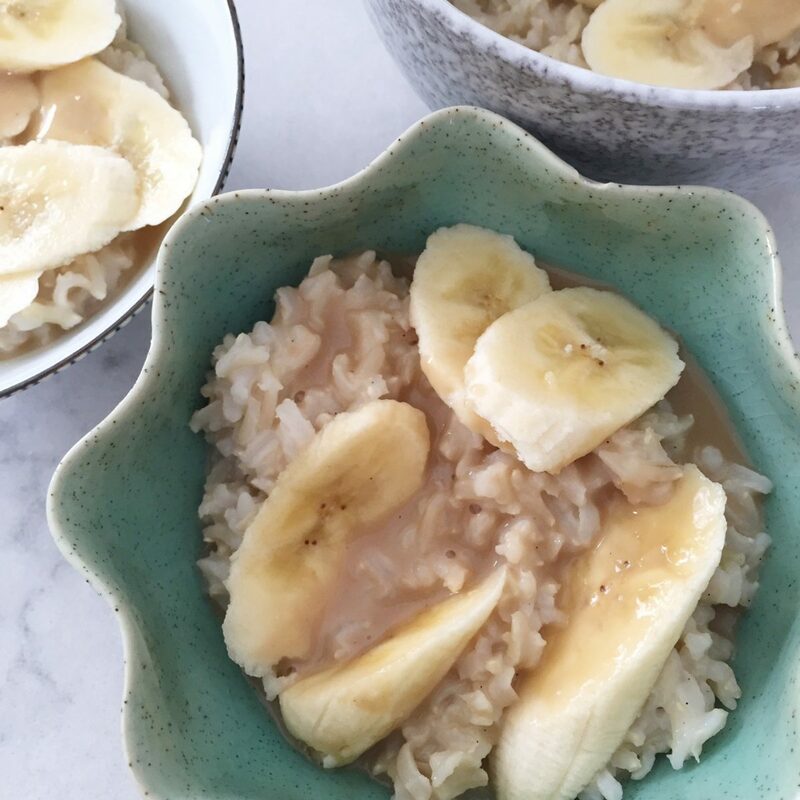 This coconut brown rice pudding recipe ticks all those boxes. I first made it when I had some leftover cooked brown rice from my Thai cooking class. Here’s my foolproof method for cooking brown rice. You can make a faster version of this if you start off with cooked rice. In the recipe below I’ll share both ways – making it with raw and making it with cooked rice. Because this recipe is pretty virtuous you can easily have it for breakfast. It has much less sugar in than any boxed cereals. I’d probably serve it without the salted caramel at breakfast and just use maple syrup or honey. 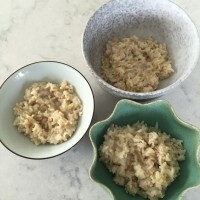 Just serve it like porridge and top it with chopped fruit. You can even eat it cold so you could make little grab and go pots to take to work for breakfast. It is also vegan and gluten free if that is important to you. My stash of frozen, cooked rice is a life saver as it means I can swipe half an hour off my cooking time for many meals. When my boys were smaller it saved my sanity many an evening by providing the backbone of quick meals for them. 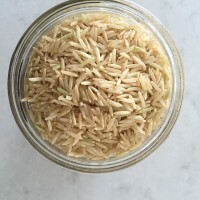 I’ve heard lots of the misconceptions about using leftover rice from my students and know many people are nervous about reusing it so listen up. The problem around rice causing food poisoning comes from people using leftover rice from a take out. Because many restaurants keep their rice warm during service it isn’t a good idea to reuse it for another meal at home. Warmth plus moisture is bacteria heaven, so warm rice is just dreamy for the little buggers. However as long as you’ve cooked the rice yourself, let it go cold quickly (I usually spread it on a plate and pop it in the fridge) then bag it up in whatever serving size suits you, and freeze it straight away you’re good. Then when you reheat it just make sure it is steaming hot and you’ll be fine. Shopping for coconut milk can be confusing. Most places have coconut milk in cans, coconut cream in smaller cans, and blocks of hard creamed coconut. Because of time, I tend to use canned coconut milk or canned cream. Canned coconut cream is much richer and less watery than coconut milk. If using coconut cream you may need to add a little water to recipes that specify coconut milk. In the UK coconut cream tends to come in small 160ml cans, I like the Waitrose organic coconut cream. In the US it tends to come in a 14oz can, the Trader Joe’s version in a brown can is good. Coconut milk in a can is quite watery (it is essentially coconut cream with water added), so you’ll have to cook the dish for longer to allow the excess liquid to cook off and get the consistency and richness of flavour you want. Avoid the low fat stuff as it often contains strange additives. Just use less of the full fat stuff if you need to reduce the fat content. Blocks of creamed coconut tend to have the least additives but are more labor intensive as the block needs to be grated and mixed with warm water to form coconut milk or cream. Use the following ratios of water : hard creamed coconut to make coconut cream (5:2) or coconut milk (5:1) i.e. 500g water : 100g creamed coconut. 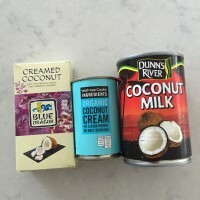 Coconut milk sold in cartons isn’t creamy enough for this type of recipe – it is intended to be used as a milk substitute in the same way as almond or soya milk. Check the labels, some coconut milks have a ton of added extras that you don’t need. That’s why I tend to get organic if I can. Put the rice, coconut cream and water in a medium saucepan. Add the vanilla and salt and spice or sugar if using and bring to the boil with a lid on. Then stir well, replace the lid and drop the temperature to a low heat so it is just simmering. Simmer for 15 minutes, stir every few minutes to check it isn’t sticking. Add a little water if it is. Once the liquid has reduced and the consistency is creamy, take off the heat and top with the toppings of your choice. Leftovers will keep in the fridge for around 4-5 days. If you want to make this extra sticky, pop the raw rice in the food processor and pulse for a minute. This breaks up the grain and allows more starch to be released. I don’t always do this stage but it does make a stickier end product. Put the rice, coconut cream and water (or coconut milk) in a medium saucepan. Add the vanilla, salt, spices and sugar if using and bring to the boil with a lid on. Then stir well, replace the lid and drop the temperature to the lowest temperature so that it barely simmers. Alternatively, you can put everything in your slow cooker or Crockpot for around 3 hours or until the rice has absorbed the liquid. If cooking in a regular pan, cook on your lowest heat for 20-25 minutes, check after 15 minutes and stir to check it isn’t sticking. Add a little water if it is. Different types of rice will cook for different times so just taste a grain of rice to test if it is cooked. If it isn’t cooked and all the water has been absorbed, add more water – just a few tablespoons at a time then stir and replace the lid until it is cooked. Once the liquid has been mainly absorbed by the rice and the rice is cooked, give it a good stir to make it more creamy then take off the heat and top with the toppings of your choice. Leftovers will keep in the fridge for around 4-5 days. This sauce combines all that is gorgeous from a salted caramel but has a coconutty side to change things up a bit. It is delicious poured over ice cream, pancakes, waffles or brownies too. Once you’ve made it it will keep in a clean jar in the fridge for a week, if it lasts that long! Put the coconut cream and sugar into a medium sized saucepan. Stir well on a medium heat then bring to a boil. Stir constantly to avoid it sticking. The mixture can bubble up to double its height so be sure that your pan has plenty of room. If you’re in a rush and don’t mind standing over the pan you can keep the mixture boiling for 8-10 minutes as long as you continually stir it with a silicone spatula. If you need a little more leeway then drop the heat to a simmer and cook the mixture for 20 minutes but only stirring every couple of minutes. If your pan starts to burn at the bottom, lift it off the heat and plunge the bottom of the pan into cold water to stop it cooking. 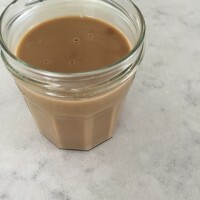 Because different brands of coconut cream have different water content, rather than just using time to see if it is ready, check that it has reduced to a thicker texture and has turned a rich, dark brown colour. Once you’re happy with it, keep it on a low heat and add the salt and vanilla, stir and cook for a minute or two before tasting. Don’t taste straight out of the pan as you’ll burn yourself. Just put your spatula to one side for a minute then taste what is on it. I usually add extra salt as I am a salt fiend. You may not want to. Store in a clean jam jar. Find more recipes for brown rice, sweet things and coconut here. I’d love to see what you end up with, so remember to share this with your friends and on my Facebook, Instagram, Twitter or Pinterest when you make it. Tag it #ystcook so I can see!